The Laboratory Mineral Separator provides quick and efficient separation of mineral grains having close specific gravity over a wide size range. 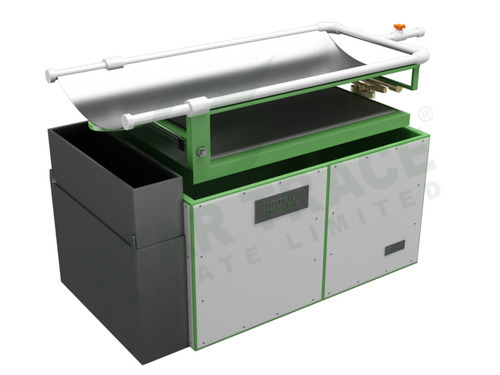 The unit is provided with easily interchangeable stainless steel trays to allow for both coarse and fine particle separations. After placing the wetted sample on the tray, the cyclic motion mobile gas the mineral particles enabling stratification to take place. Reciprocating horizontal movement of the tray ensures effective separation. The heavy minerals sink to the tray surface and are thrown up stream by the end knock action. The lighter minerals are carried downstream by the flow of irrigation water and discharged via the tailings launder. The unit has flexibility for adjusting the inclination and speed.choice of "v" profile tray (for separations in 1000 to 100 micron size range), flat tray (for separations in 100 to 10 micron size range) is available. Best suited to obtain data on higher sp. gr. ranges.fast assessment for gravity concentration performance. 50-100 grams sample can be tested at a time. Power requirement: 2 pole, 6 amp mcb (single phase with earthing) ac, 50/60hz, 230 v, motor: 0.37 kw, (0.5 hp), 1415 rpm.